USA CUBA TRAVEL: A Destination & Travel Guide to Old Havana, Cuba. 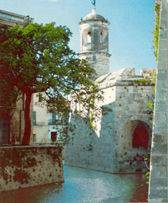 San Cristobal de La Habana Villa was founded in 1519 and shortly afterward became the capital of the island. For centuries it was a strategic center of colonial Spain. Owing to its characteristics as a port city and its unique geographical location at the mouth of the Gulf of Mexico, Havana quickly took on a predominant positionas a trade and communications link between the Old and the New Worlds, while, at the same time, receiving the title of "Key to the Gulf". The city became a desirable prize, targeted by corsairs and pirates who attacked it on countless occasions, forcing the metropolis to build a defense system which was unique in America, and to construct a surrounding wall. Old Havana still houses vestiges of its origins, such as the Alameda de Paula, next to the port, the Plaza de Armas and Cathedral Square, the Castillo de la Real Fuerza and the Morro and La Cabana castles, the Palacio de los Capitanes Generales, the Palacio del Segundo Cabo, as well as the ruins of the walls that once surrounded it and the brick streets that have defied time in order to reveal all the greatness of the past. 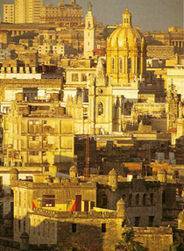 At the end of 18th century, Havana began to expand beyond its tight limits and Havana-outside-the-walls was born. With the demolition of the wall in 1863, a process of urbanization was underway and the city experienced growth in every sense of the term. In 1902, after the U.S. intervention and the establishing of the Republic, the old part of Havana entered a period of decadence even though it still contained buildings of genuine architectural value. In 1982, the old historical area, the urban extension of 19th-century Havana, the port channel with its two developed shorelines, and the fortifications that served as its defense were declared a human heritage jewel by UNESCO, giving international recognition to the policy of safeguarding the city's historical and cultural value. Thus the visitor inevitably explores brick streets and alleys; visits castles, forts, the ruins of city walls, buildings, monuments, museums, churches, mansions, elegant houses and squares; enjoys a view of colonial roofs, stained-glass windows, grates, low walls, balustrades, arcades and balconies in an astonishing profusion of styles; savors a Mojito in Bodeguita del Medio, along with the delights of the best and most authentic Cuban traditional food, or sips a Daiquiri in El Floridita, just as Hemingway did years ago, always astonished by the charm of this enchanting and enchanted city; is photographed next to the beautiful Baroque Cathedral; or chooses the sun and breeze as partners during a walk on the long Malecón, alongside the sea, while enjoying the happiness of the Cubans who come there to talk, fall in love, read, bask in the sun, have a quick sip of rum, or touch the ocean water with their very own hands. its inception, this plan has spawned a whole range of specialized houses and museums, fine hotels, gastronomic restaurants and new commercial activities. The remodeled buildings in themselves provide an incredible sampling of the many architectural styles as well as the historic value of this splendid city. Thanks to this ambitious project, the most impressive city of the Caribbean has been reborn and has served to echo Cuba's unique identity and culture. Traditions, legends and history have combined to make Old Havana a historical heritage jewel, renowned for its magnificent buildings, squares and churches, all of which date back to colonial times. City streets are still paved with cobblestones. Happy mestizo faces look down from balconies adorned with lush vegetation, re-enacting a scene that is centuries old. USA CUBA TRAVEL invites you to experience the elation of walking through a mystical city whose worth has been established over the centuries, to savor its culture, discover its people and relive history by staying in one of the fabulous historic hotels of Old Havana. 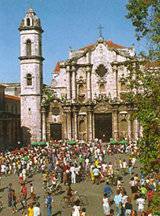 USA CUBA TRAVEL also enjoys a privileged relationship with the fame Havana Historical Office; thus we can provide our customers with private tours of Old Havana, an introduction to a city that is rich in historic content.